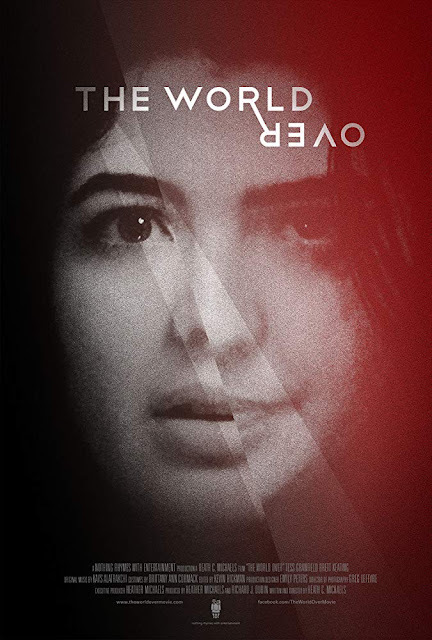 The World Over is a 17 minute short horror directed and written by Heath C. Michaels that had a story concept that I just loved. It starts off with a special key, and from there goes to some great places. I have always loved the idea of time travel and alternate dimensions and so what is suggested here pleased. The World Over was quite great, with all the different versions of themselves the couples come across it took me a moment of stupidity to realise when watching the end credits that of course there were only the two actors. There is an inherent creepiness to the portal and it leads to moments of real horror with violence something that does happen. For me it seemed to be a comment on just how far someone would go to be with the person they love, if there are an infinite numbers of yous then you would feel your the most important version, but so would every single other version of you think that of themselves. The director states "..for someone who is isolated with themselves as their only company, I cannot imagine anything more horrific than being with more versions of yourself" which does actually resonate with me who is a bit of a loner. The acting was good with both the two working well together. Granfield had the more screen time and it was her interactions with her doppelganger that had the most uneasy aspect to them, reminding me a bit of Another Earth's shock ending (and of course Rick & Morty). I would say the actual conversation she has with herself felt a bit like it was designed for the viewer to fill them in just in case they were not following the storyline. While the house it is in felt a little sparse it was the little details that really helped, the subtle differences both in the set decoration and lighting, as well as the subtle differences in the temperaments of the characters helped make things seem different and weird. This was a original feeling short that kept me focussed throughout with no detail seeming to be there just to fill in running time, a short that makes you think. The World Over had its world premiere at the Bucheon International Fantastic Film Festival in South Korea earlier this month, check out the teaser trailer below. This is intended as a proof of concept for for a feature film, and if that is anything near as clever as this it will be a film worth seeing.